TE Connectivity. As the aerospace industry shifts towards more electric aircraft, manufacturers are installing more electric motors, actuators, control systems, sensors, diagnostics and electronic systems. These are driving adoption of additional cabling, as well as electrical and data terminations. In turn, the need for identification is growing rapidly – both in terms of volume of markers and their importance to effective operation and maintenance during the lifetime of aircraft. In the light of this, it is essential that manufacturers find new and more efficient ways to manage identification – and TE’s HPR100 labels can support this. 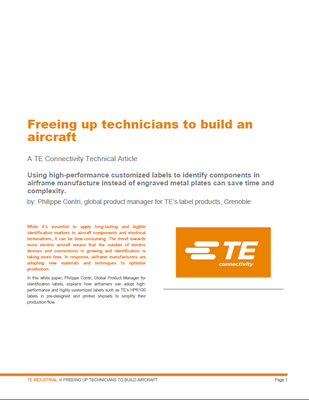 In this white paper, Philippe Contri, Global Product Manager for identification labels, explains how airframers can adopt high-performance and highly customized labels such as TE’s HPR100 labels in pre-designed and printed shipsets to simplify their production flow.